Let's have fun and let's learn french with Tréma! Come play and learn French with Tréma in Canada. 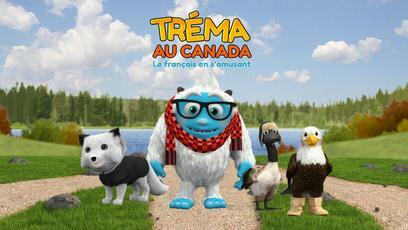 Tréma the Yeti and his friends take you to explore lots of fun games and to discover Canada in their 3 adventures! So, are you good in grammar? What is the female name of «sanglier» ? Will you be able to fill in the blanks by finding the right verb? What is the word family of «festin—»? Assess your performance and have fun comparing your score with that of your friends. Psst ! Earn more stars to unlock bonus games and discover secret stories!